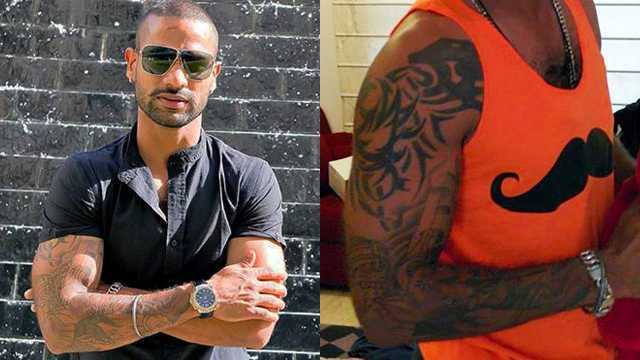 Shikhar Dhawan sports tattoos on most of his body parts, especially on his bulging biceps. Both he and his half-Bengali wife are self-confessed tattoo addicts. He got his body inked at the age of 15, without telling his parents. The batsman is simply a tattoo freak. Figures from Indian mythology, there’s Arjuna, the character from Mahabharat symbolizing determination, Lord Shiva and Baba Deep Singh share an elbow room on his right arm. There is a ‘Carpe Diem’ on the back of his left biceps. The body ink shows his urge to make the most of the present time and give little thought to the future. Shikhar is really fond of some cool tribal designs. There is a tribal design tattooed on his right shoulder, and another one is on his back. A tattoo of a bird with a leafless tree covers his left calf. On his left wrist, he has his wife’s name that is ‘Ayesha‘ inked. The tattoo shows Shikhar’s love for his wife.